We provide extra services including dishes, laundry, fridge checks and more for your loved ones. 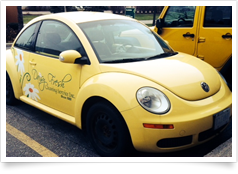 Look for the Daisy Fresh Beetle in your area! ...your dedication doesn't go unnoticed. Enjoy a coffee on us because you're the best! ...feel organized and in control. The team(s) does a great job. our home clean and tidy. Our family couldn't run without your help! They are to be commended to the highest level. ...Thank you to the team for really an outstanding job. I owe you for the additional work. ...I can hardly recognize the rooms! ... I'm so happy to walk back into my beautiful clean home! [They] are my favourite cleaning team. ....They made our life better today. ...love the ladies that you had over here. ...it is great with your help to be able to stay here as long as I can! As always, the place looks fantastic! You are a magic maker!! 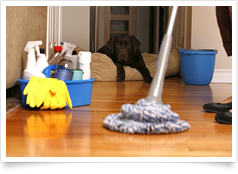 We regret to inform you we are fully booked and unable to take on additional cleans or clients at this time. Do you have a driver's license and vehicle available for work use? We're currently hiring part-time and full-time position. Candidates must be available Monday through Friday from 8:00am to 5:00pm. See our job ad on Indeed.ca for more information or email us your resume.